Ever go into the dressing room with several brands of the same size and have them all fit differently? Did you think there was something 'wrong' with you? Well, there is certainly something wrong with the sizing of ready-to-wear clothing. 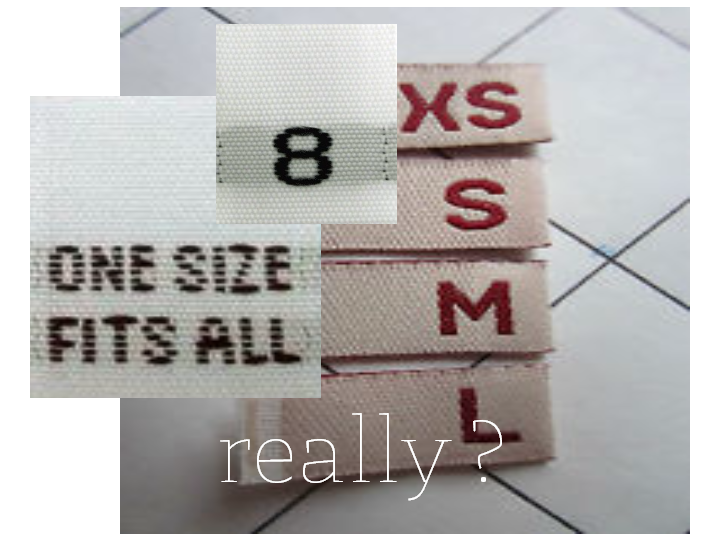 There are standardized measurements for US clothing production but few companies use them. They are not mandated. Let me show you how crazy the US sizing for women's clothing is. 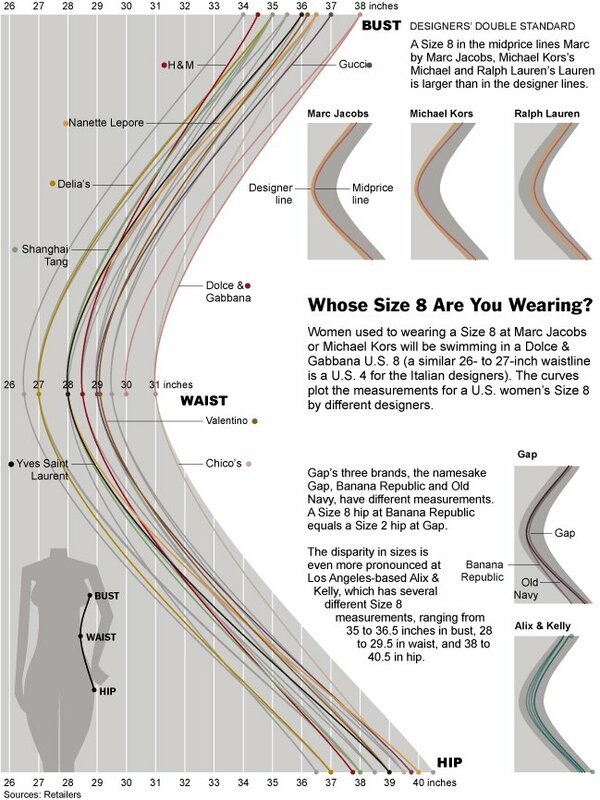 The chart below from the NY Times is really helpful in understanding the variance in measurements for a size '8'. Just a few stats that stand out are a measurement for a Valentino garment with a waist of 29" to Delia's at a 27" - 2 inches difference. A waist measurement at H&M is 28.5" while at Chico's it is a 31. Really, that's a 2.5 inch difference! Now, I know H&M caters to a younger market than Chico's but a 2.5" difference is pretty substantial. It's enough to make you feel skinny at Chico's and fat at H&M all in the same shopping trip. To make matters more complicated, many design houses have different sizes within the same company. Gap, Old Navy, and Banana Republic are all the same group but have very different sizing. A size 8 hip at Banana measures a size 2 at the Gap. Chalk this up to what the industry calls 'vanity sizing'. It stems out of our obsession to connect our size with our self esteem. Over the last 40 years or so, sizes have steadily become smaller as women have become larger. Yes, we are larger than we were in the 1950's. The average woman in the US is now about 5'4" and weighs 155 lbs. We are about 20 pounds heavier than our 1950's counterparts. The average woman now, according to the ASTM (American Society for Testing Materials) size guidelines, should wear a size 16, but thanks to vanity sizing she is probably buying a size 10. I have been using vintage sewing patterns lately and have been astonished at the size differences between from the 50's and 60's to now. A bust size of 38 was then an 18, now a 38 bust is a ready to wear size 10. Patterns then were congruent with sizing in the stores. Pattens today do measure a larger size than retail clothing and are not in line with retail sizing. It can bring shock to the home sewer to see that she wears 2 sizes larger or so in a pattern than at the store. Fashion sizes have been irregular for decades. A woman with a 32" bust would have worn a size 14 in 1937, by 1967 she would have worn a size 8 and currently, she would be a size 0. No wonder so many women are confused and feel stressed out by the number on the tag! The UK has a standardized measurement system. This type of sizing diagram is printed on the label . Approximately a 35.5" bust, 29" waist and 38.5" hip. So, what's a girl to do? Until the US falls in line with the UK and starts mandating measurements on all tags we will have to take matters (measuring tapes) into our own hands. Measure yourself before you head out and then take a measuring tape with you to shop. Measure the key areas of the garment (bust, waist, hip) BEFORE taking them into the fitting room. Concentrate on how that number matches up with the garments you want to buy not the # on the tag! Beauty can take many forms. 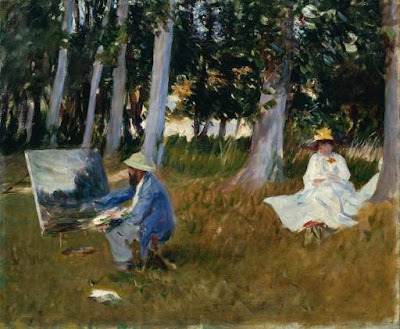 But today, I want to talk about the beauty of quality and practicality. 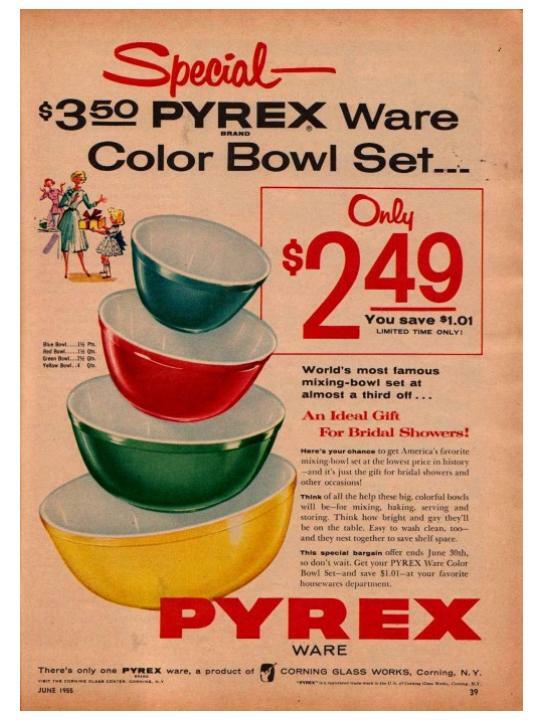 I have been collecting Pyrex bowls lately. Not like a serious collector, but looking every time I go to the thrift store. My Mom received this set pictured above as a wedding gift in 1946 and I grew up using it. She still has and uses the large bowl. Really, how many daily use items are still around from 1946? These babies were made to last. My collection started a few years ago with the little red one I found for a couple of dollars. I had seen sets for sale in antique stores and higher end consignment boutiques but didn't want to spend the collector price. Last month I finally snatched up a complete set for $15 at an estate sale and now I feel totally satisfied, well, at least until my next thrift store trip. 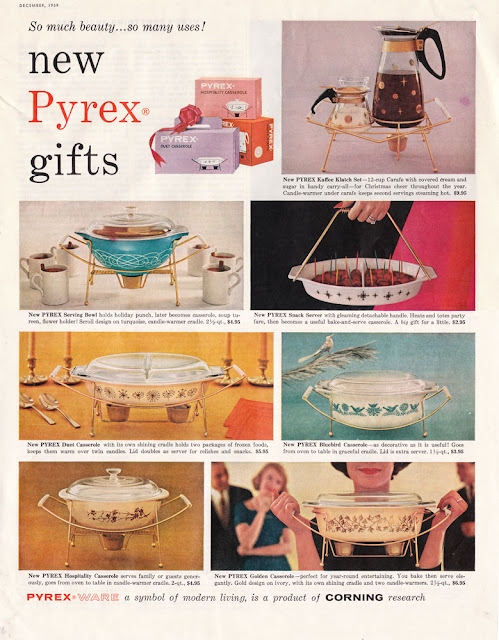 I've got several Pyrex pieces from different eras now and I love them all. 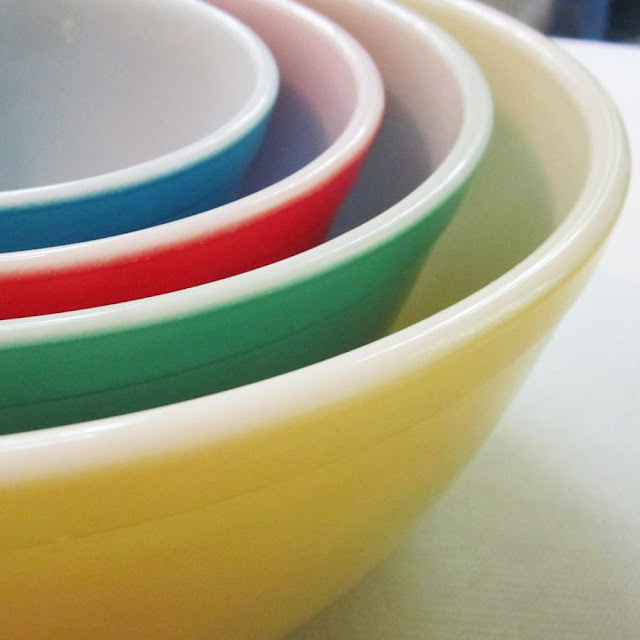 Most of my other bowls have gone to the thrift store in favor of these gems. They are designed so well - the the best sizes and depths. One of my favorite new pieces is this casserole dish. I grew up using similar ones. So handy...oven to table to fridge!